Chila Kumari Singh Burman is one of the most important British artists of South Asian background practising in the UK at the present time. Born in Liverpool in 1957, she was one of the first of a British-born generation of diaspora artists to complete her art school education, first with a BA from Leeds Polytechnic, then graduating with an MA in printmaking from the Slade in 1982. She has taken printmaking as her preferred medium, moving from the more traditional forms of printmaking, such as etchings, lithographs and screen prints, through to more recent forms of printmaking, which utilise modern technology such as colour photocopying. Her work has for many years consistently embraced photography and the photographic image, ranging from self-portraiture to found imagery. Burman’s work has always been characterised by an unswerving commitment to a range of social and political narratives. To this end she has produced some of the most compelling work that is reflective of the frustrations and the aspirations not only of Burman’s own generation, but also her parents’ generation of immigrants. Typical in this regard is her 1980s print You Allow Us to Come Here On False Promises, in which a range of images, symbols and texts are montaged to form a protest against what the artist regards as punitive institutional discrimination. The print features John Bull as Margaret Thatcher (or Margaret Thatcher as John Bull). From Thatcher’s mouth comes a speech bubble with her infamous words of 1978 in which she speaks of a ‘fear’ of the country being ‘swamped’. For good measure and effect, Burman includes in the screen-printed collage an image of the South African runner Zola Budd, given British citizenship by Thatcher’s government, to enable her to compete for Britain in the then upcoming 1984 Olympics. Such a gesture was interpreted by many as a slap in the face for those Black people (many of whom were Commonwealth citizens) denied entry to the UK, as well as implying tacit support for South Africa’s apartheid system. Burman’s prints range from the contemplative and the reflective, such as Me Relaxing in New Delhi through to her more recent work that is influenced by and reflective of advertising and popular culture. Particularly indicative of these concerns and interests is her colourful and expansive series of prints of bras. Burman’s work reflects a longstanding interest in the strength, beauty and symbolism of women’s bodies. Noteworthy in this regard is her series of body prints, in which she literally prints using her unclothed body. In the mid 1980s Burman undertook several mural commissions in London. One was executed as part of the project to rehabilitate the Roundhouse in north London as a Black arts centre. The other was executed in collaboration with Keith Piper as part of the GLC’s Anti-Racist Mural Project. 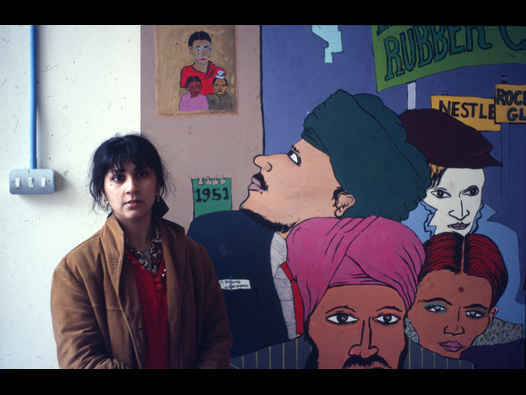 Their mural, painted on boards, was intended to reflect something of Southall’s important history as a site of resistance and struggle. The mural generated some controversy. Burman has an extensive CV and her work has been included in numerous exhibitions, both solo and group, throughout the UK and elsewhere in the world. She took part in several of the pioneering exhibitions of Black women’s work that were such a distinguished feature of Black visual arts activity in 1980s Britain. In the mid 1990s Burman was the subject of a monograph written by Lynda Nead and published by Kala Press. The book was titled Chila Kumari Burman: Beyond Two Cultures. A prolific artist, Burman’s work continues to find new audiences in different parts of the world, as well as securing increasing media coverage. Furthermore, her work has, latterly, evolved from the two-dimensional into the realm of installation/performance, centering on her innovative use of an ice-cream van to animate aspects of her family history. In 1997 she was included in the large New York exhibition, Transforming the Crown.